Whether comprising analogous or complementary colors, trio color palettes help create bold, dramatic, striking interiors. As an array of aspects should be taken into consideration, from homeowners’ preference to the size of the space, its natural light exposure, and who uses it and what for to the style and atmosphere that have to be created to even color trends, choosing a color scheme for any interior is challenging. Colors can make or break any space, unquestionably, they influence the way people perceive rooms. In addition, hues help create a sense of coziness, romance, mystery, or drama. Although the options to choose from are practically limitless, there is a range of tried-and-true colors and color combo that easily come to mind, such as neutrals and combos found in nature. 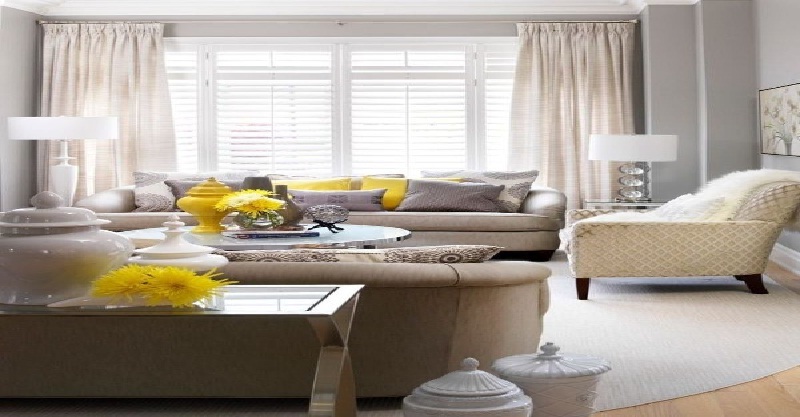 Furthermore, some fail-safe combos, such as black and white, white and blue, and yellow and gray, and yellow and blue, can lend any space both a timeless and fresh look, they never go out of style and always work perfectly well in any space. When it comes to creating bold, intriguing interiors, homeowners usually choose to work with color trios. Consisting of subtle, gentle hues or strong ones, these combos help create attractive and impressive spaces. Some of these combos may seem surprising, such as the one comprising burnt orange, olive, and taupe. However, designers claim the combo works in almost any space and makes it look warm and inviting. As for no pros working with more than two colors could prove to be truly daunting, designers advise sticking to the simple 60-30-10 rule, which means that 60% should be the main color, 30% – the secondary one, and 10% – the accent hue. Unquestionably, in all its variations, red is a bold, powerful, attention-demanding color. As for some people it is too aggressive and overwhelming to be used alone, red is usually balanced by black and white. These three colors make a timeless, can’t-go-wrong color combo. It is exciting and captivating, with undeniable charm, works well in any space, and depending on the used tone, shade, or tint of the color red, this color trio helps create a range of interiors, from opulent to refined to sleek and modern. However, when working with two strong colors, such as red and black, always be careful and let white dominate the space, this is the key for creating visually appealing, elegant rooms. In the picture above, a contemporary living room with a distinctive architectural character. In this space in black and white, a red accent wall immediately draws the eyes. A modern floor-to-ceiling fireplace and furnishings introduce black into the space. An oversized potted tree and a piece of wall art add visual interest. Flooring adds texture and creates a sense of warmth. Truly a dramatic room! Above, a dream-come-true kitchen. This almost all-white space definitely offers functionality and charm. 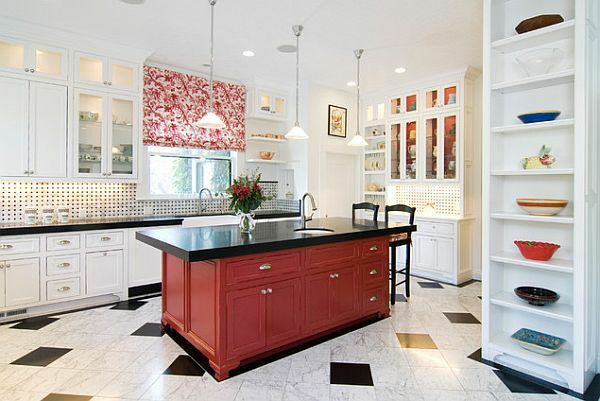 A unique kitchen island in red and black complemented by elegant bar stools makes a strong statement. Lit upper cabinetry adds to the appeal of the kitchen. A Roman shade coordinated with the bar stool pads brings some extra doses of red. A flower arrangement adds freshness. What a stunning way to work with the red-white-and-black color trio! Above shown, a chic bedroom in black, white, and red. Glossy flooring, furnishings, and pieces of art in black stand out against the white walls. Black floor-to-ceiling drapes add touches of luxury and sophistication. 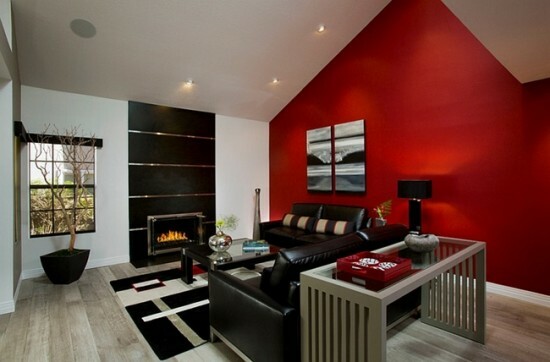 Stunning red accents create visual interest. An elegant floor lamp offers extra artificial light. Faux furs help create a textural look. Unquestionably, a dramatic space! Definitely, red is a hue that always commands attention and makes color combos that can lend any space an unmatchable look. Another classic, no-fail color palette in which red is involved and never goes out of style is the red-white-and-blue one. Extensively used all over the globe yet especially popular in the USA, this trio is a bold, exciting combo that helps create diverse, incredible, appealing interiors, from welcoming and cozy to traditional, balanced, and elegant to sleek and chic. In the picture above, a bold living room in blue, white, and red. 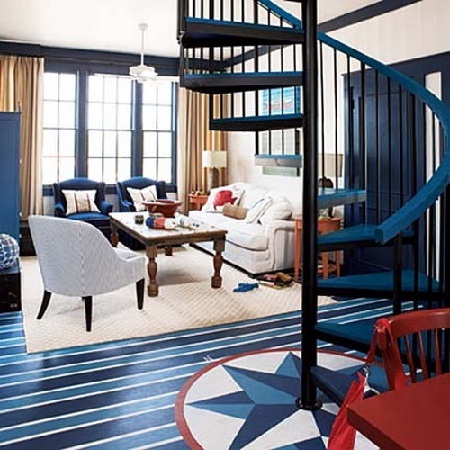 A spiral staircase painted in blue definitely makes a statement. A floor medallion adds uniqueness. Furnishings and accessories in white and alternating shades of red and blue are tastefully positioned throughout the space and help create a bold interior with tons of personality. This trio palette can enliven any interior and works well with a range of design styles. However, as red, white, and blue are usually associated with summer and sea, beyond doubt, these colors make a classic coastal-inspired combo. Whether tranquil and soothing or bold and attention-demanding, it is always charming and with an unmatchable look. Furthermore, it allows mixing and matching patterns and still achieve an elegant, sophisticated look. Above, a modern bedroom with a coastal vibe. A bed with a stunning headboard immediately grabs the eye. Washed-out red used for the bedding and accessories creates a sense of calmness. A unique chandelier adds touches of gold. Flowers bring extra doses of freshness. An impressive bedroom, don’t you think? 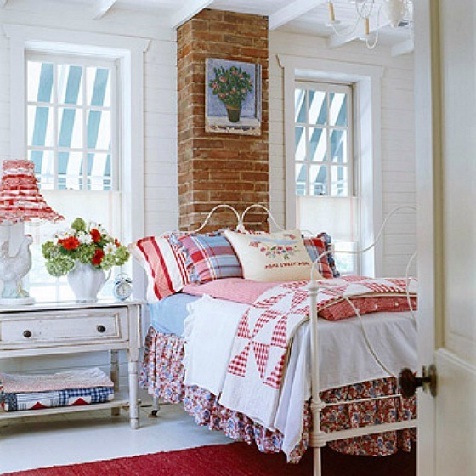 Above shown, a charming country cottage bedroom. A bed with an iron frame makes a statement in the space. 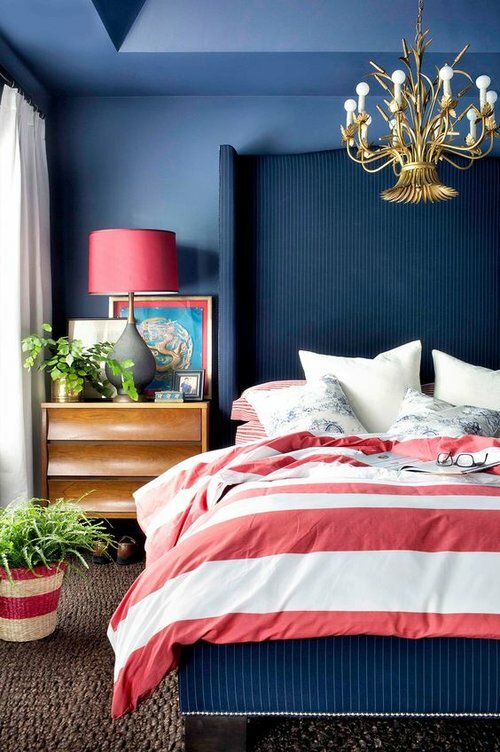 Accessories in blue and red stand out in this predominantly white space. A rooster lamp makes a fascinating Country-style touch. A flower arrangement adds color and freshness. Speaking of cottage-style interiors, they also make use of some adorable color trios, such as blue, white, and yellow and white, pink, and blue. From French Country to rustic, coastal, and vintage to contemporary and eclectic, cottage-style spaces exude comfort and softness, they are romantic, welcoming, with casual settings, and usually with mismatched, repurposed pieces of furnishings. Incorporating a variety of patterns and textures helps create unique interiors with undeniable charm and tons of personality. In the picture above, a fascinating French Cottage/Provence/-style bedroom. 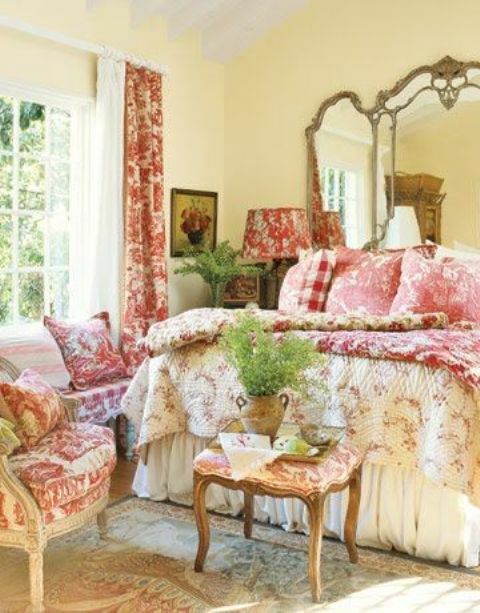 In pastel red, yellow, and cream, with distressed furnishings and floral-patterned textiles, this space radiates warmth, coziness, and appeal. A stunning mirror adds personality. Flowers bring pops of green and create a sense of freshness. Pure perfection! When it comes to Provence style, red, yellow, and black make another fascinating color trio. Black accents anchor the space and add touches of sophistication. 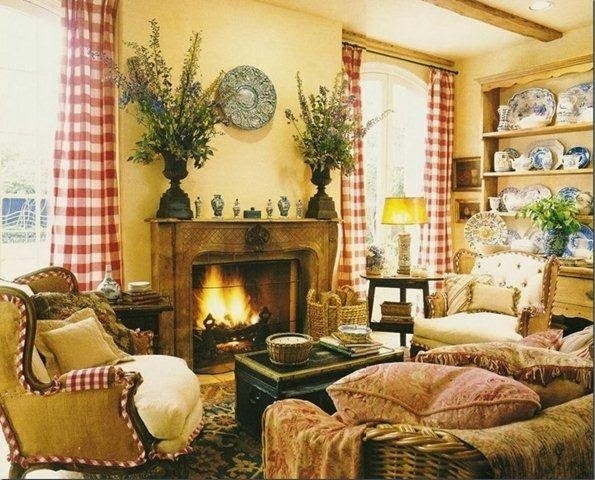 Above shown is a Provence-style living room with a textural look and a range of patterns. A fireplace complemented by exposed beams, an area rug, and plenty of throw pillows create a sense of warmth and coziness. Arched floor-to-ceiling windows offer adequate natural light. An antique chest repurposed as a coffee table and a pair of matching urns positioned on the mantel make stunning black accents. Accessories add to the appeal of the space. What a fascinating living room! However, working with analogous and complementary colors helps create exciting interiors with an unmatchable look. Depending on the used colors and/or their tints, shades, and tones, interiors can vary from harmonious and slightly monochrome to formal and sophisticated to bold and dramatic. Color trios comprising analogous and complementary hues work well in any space, traditional or contemporary. 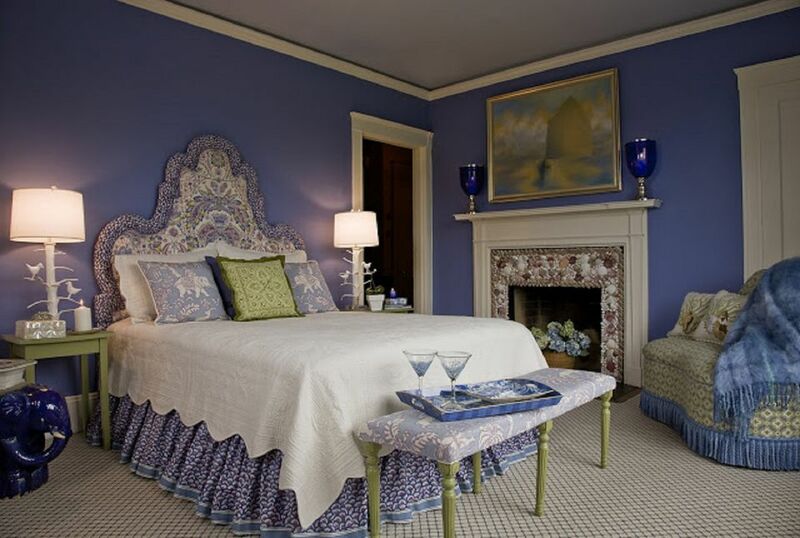 Above, a fascinating traditional bedroom in a blue-purple-and-green color scheme. Bold periwinkle walls are complemented by delicate tints of green, purple, and blue. White is used for balancing the space. A magnificent headboard and a stunning fireplace surround add visual interest. Unquestionably, an adorable, inviting space! Whether working with a classic, tried-and-true color trio or with an unexpected yet exciting combo comprising three hues, color trios are always an option to create striking interiors with an inimitable look.